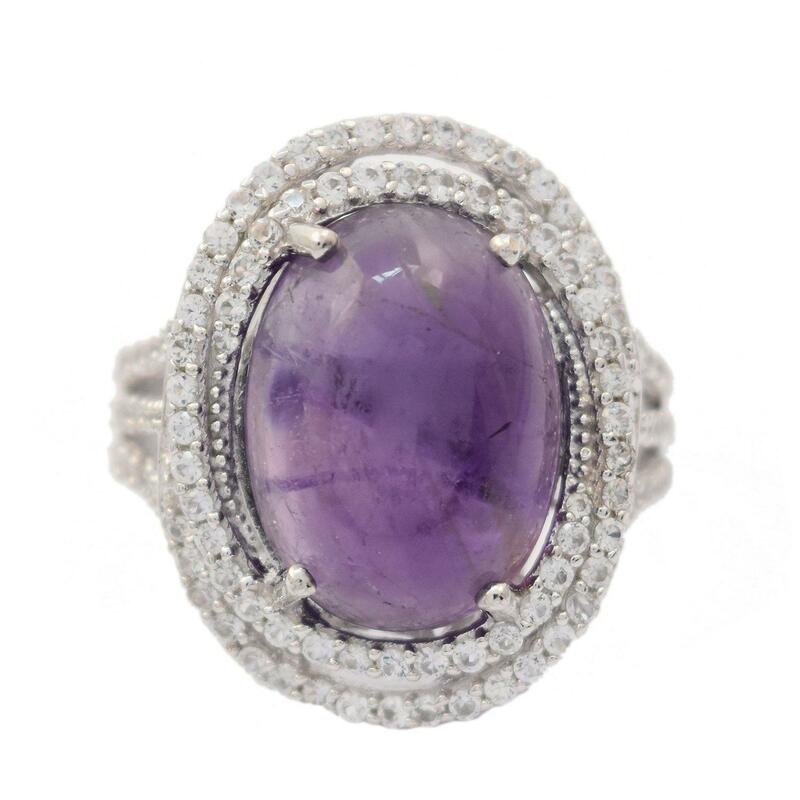 Electronically tested 925 silver ladies cast amethyst and white sapphire ring. The featured amethyst cabochon is set within intertwining white sapphire set bezels supported by three-way split white sapphire set shoulders, completed by a two and one-half millimeter wide band. Bright polish finish. Trademark is Orianne. Identified with markings of "925". Condition is new, good workmanship. One prong set oval cabochon cut natural amethyst approximate weight of 10.50ct., clarity is moderately included, type II, medium dark, very slightly grayish, purple color, (GIA P 6/3), cut is good. Transmitting light somewhat diffusely, transparent to translucent, Naturally occurring internal & external characteristics are present, Graded in the setting. One hundred two prong set round mixed cut natural white sapphires approximate total weight of 1.25ct., clarity is eye clean, colorless, very slightly grayish, white color, (GIA W 0/3), cut is good. Transmitting light with no distortion, transparent, Color grade is an average for the group, Graded in the setting.